Cleaning rain gear can be a little bit more than you bargained for. If you were outside at all today your rain gear probably got a pretty good workout. So, we here at Mulberrys thought we might give you a few tips on how to keep your rain gear clean if the rain ever stops. 1) The first thing to know is that the way manufacturers make your rain gear water resistant is with a coating. While this coating is very effective at fending off water, it is often vulnerable to heat, alkalinity, or other chemical processes that occur in laundry and dry cleaning. 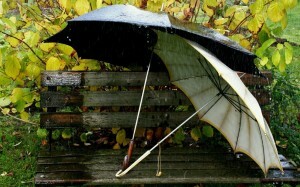 2) Next, because of frequent exposure to water, rain gear often gather mildew or other mold that gives it a dank smell. As a result it is really important to give your rain gear a quick wash before you put it away for the evening. 3) When you want to clean your rain gear make sure to zip up your zippers because they can easily snag and or damage the coat’s coating. 4) More traditional detergents like Tide often have too much alkalinity for rain coats and can damage the coating so we recommend a more mild detergent like 7th Generation. 5) Finally, and most importantly, make sure to dry your rain clothes on a low heat or preferably no heat setting. This will protect the coating and make sure that you avoid any fiber changes. Or, if all that seems like more than you want to worry about feel free to stop by one of our six metro area Mulberrys dry cleaners and we’ll take care of the process for you. We also offer free dry cleaning delivery to your home or office, so that you can avoid the rain entirely.